NSPS Subpart JJJJ: Standards of Performance for Stationary Spark-Ignited Internal Combustion Engines (often referred to as “Quad J”, but formally known as 40 CFR Part 60 Subpart JJJJ). Quad J limits engine emissions such as nitrogen oxides (NOx), volatile organic compounds (VOC), and carbon monoxide (CO). 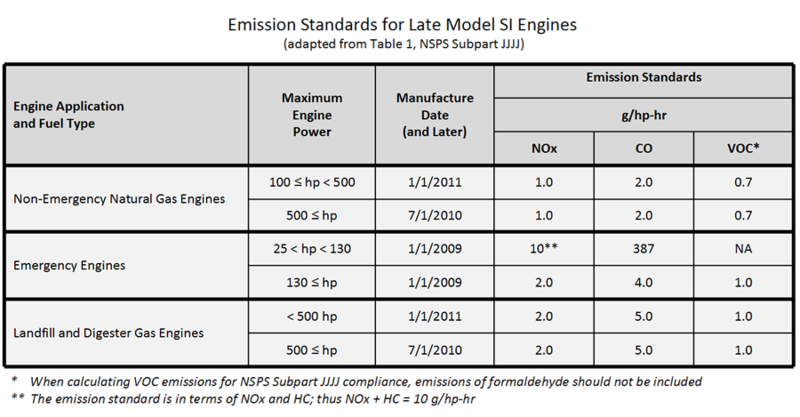 The limits pertain only to new engines, and become progressively lower with later model years. The EPA distinguishes spark-ignited engines based on power output, manufactured date, as well as combustion type (lean-burn or rich-burn), and application (emergency or non-emergency electrical generator set). The emission standards for NOx, CO or VOC vary among each engine class. If you are interested in learning more about how New Source Performance Standards can affect your business, be sure to speak with an AeriNOx Emission expert. We can assist you with any questions you have, including those regarding NSPS Subpart JJJJ, as well as State and Local emission standards. Normally, it is the engine manufacturer’s responsibility to make sure the engine meets the emission requirements. However, because fuel quality varies widely across the country, the EPA does not require the engine manufacturer to certify most engines. To demonstrate compliance, the EPA requires the engine owner or operator to conduct an exhaust stack test once the engine is installed at the site. Thus compliance becomes the responsibility of the engine owner. In such cases, it may be necessary to install additional emissions control equipment to mitigate NOx emissions, such as Selective Catalytic Reduction (SCR) for lean-burn engines, or Non-Selective Catalytic Reduction (NSCR) catalyst for rich-burn engines. Control of VOCs and CO are usually achieved with either an Oxidation Catalyst (for lean-burn engines) or a NSCR (for rich-burn engines). Emission control in engines fueled by landfill gas or digester gas is less common, mostly because fuel impurities such as siloxane rapidly foul the pollution control device (and sometimes the engine itself). While siloxane scrubbers have been in existence for sometime, they are usually large and very expensive. Recently AeriNOx’s parent company, DCL International, developed a more efficient and cost-effective siloxane scrubber that removes harmful impurities before they are combusted in the engine. Such a scrubber is also an enabler to lower engine emissions, allowing systems such as SCR and oxidation catalysts now to be used as with any other gas engine. The EPA sets emission standards for spark-ignited engines installed across the United States and its territories. However, many States and Local air quality authorities have more stringent air quality targets, particularly if the air quality in the region is poor. Under such circumstances, it may be necessary for additional emission control to a spark-ignited engine even if it meets the Federal NSPS Quad J standard.